Joshua Davis Small businesses have had mixed reviews when it comes to Groupon, the online discount coupon provider. 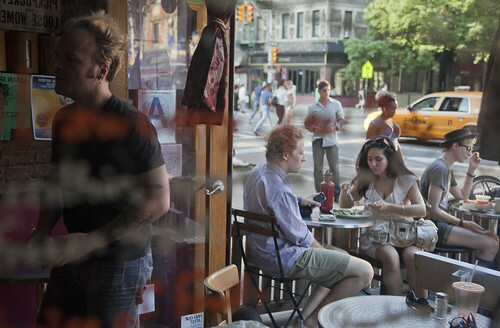 Atlas Cafe, 73 Second Avenue, uses Groupon as another way of advertising. For a neighborhood with some of the highest concentrations of bars, restaurants and retail stores in New York, the East Village stands as a prime location for a coupon provider like Groupon. But with questions being raised about Groupon’s business model, as well as complaints from some small business owners, The Local checked in with five East Village businesses to learn about their experiences with the coupon site. While most business owners interviewed said that they saw an influx of customers, some voiced unhappiness with what they they saw as a lack of support by the site. Joshua Davis A display at Ibiza NYC. Nearly all the business owners interviewed said that they were initially attracted to Groupon because they heard they could lure new customers through Groupon’s online promotions. That is what led Metropolis Vintage Apparel owner Richard Colligan to sign on with the company. The typical Groupon deal works like this: a store devises a discount coupon with Groupon, say $50 for $100 worth of merchandise, and both parties split the revenue, each taking home $25. Twenty-five dollars may not seem like a lot of revenue for $100 worth of vintage clothing, but, Ms. Mossler says, Groupon is able to promote deals to “thousands” of people that reach beyond a business’s typical customer base. “My whole feeling is that I’m not going to make much money off of it, but I’m going to gather new customers,” said Mr. Colligan. 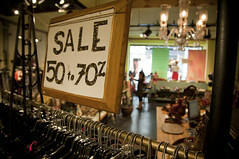 One store owner said she was not enthusiastic about discounting prices for Groupon as a way of finding new customers. Carole Husiak, an owner of Ibiza NYC and Ibiza Kidz said she was banking on the new customers coming in and spending more than what the coupon was worth. “It’s not quite working the way we had hoped,” she said, explaining that the majority of Groupon customers would spend less than $10 more than the coupon value. Not every store using Groupon has seen an influx of new customers. 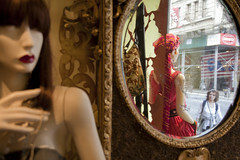 VampireFreaks, which sells “high quality gothic and alternative fashions,” has had no new Groupon customers come through their doors, said store manager Chloe Wagner, who suggested that her customers may be more responsive to local advertising rather than a national coupon site. Joshua Davis Some of the selection at Ibiza. For those businesses seeing a fresh customer base, questions remain as to how many new customers will become repeat customers, though some see a brighter big picture. Walid Atlas, owner of Atlas Cafe, which recently had a 40 percent discount on energy shakes, says he lost money from his Groupon promotion, but equates the loss to the cost of advertising. “It’s good publicity, but you don’t make any money,” he said. “It’s like making ads, but you pay for a promotion” by Groupon.